This recipe is still very much in development stage. On my last supermarket trip I bought couple of salmon sausages on a whim and now I had to come up with a way to cook and serve them. I did a search on Google and almost all hits were recopies on how to make the sausages but very few on cooking them. Decision on how to cook the sausages was fairly straightforward since there are basically only three choices: pan fry, grill, bake or poach. My choice was the simplest, pan frying. The choice of what to serve it with or on was more complex. Do I serve it as a hotdog or on top of rice or some sort of noodles like cellophane or rice noodles? Since I had some leftover Somen noodles from last night’s dinner the decision was basically made for me. All I had to do was add some julienned cucumber and radishes plus arugula and dress it with rice vinegar dressing (one part each of rice vinegar, Mirin or honey and water). 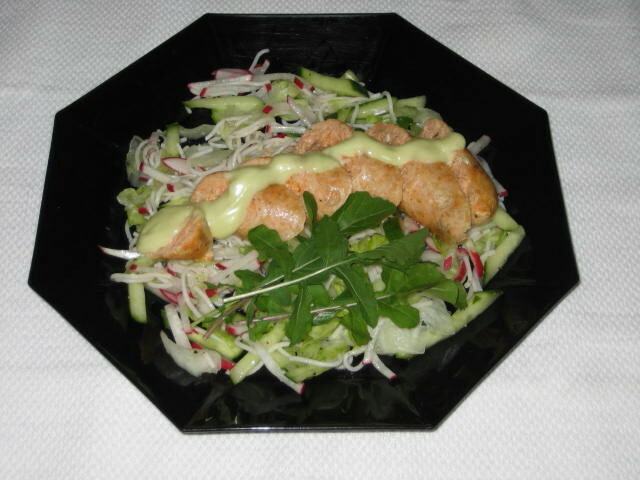 I sliced the salmon sausage, served it on top of some noodle salad and topped sausage slices with mayonnaise & wasabi sauce. Next time I will try glass noodles (cellophane, mug bean, starch noodles…too many names for same noodle) or rice vermicelli with teriyaki sauce. Seing the somen noddles, I wondered if you knew the difference between yet-ca-mein (name branded by Wing's) noodles and somen noodles (other than being Chinese and Japanese) ? As of a few years back, the yet-ca-mein noodles were almost exclusive on supermarket shelves next to the rice vermicelli. They're Wing's interpretation of a noodle for the yaka mein soup. You’re giving me the taste to make a detour to Chinatown! A shop that I know of almost has a floor of noodle. You take a narrow staircase to the second floor and there they hide. All in bags of unreadable markings. Somen, even today, is still of an oddity for most market that will stock them in remote corner. A while back, I bought a few bags of somen that I used here and there... for soup exempli gratia.